Seriously, stop drinking bottled water. Things are bad, guys. The fires that have ripped through California are just a taste of what’s to come. The oceans are in dire straits. All plastic ever made—like nine billion tons to date—is just out there, leaching toxins into the environment for the indefinite future. Humanity has been making some very not-good choices since the industrial revolution, and each day we’re slipping further into the vicinity of irreparable harm. Granted, anything you do as a individual person who isn’t a titan of industry is a drop in the bucket, but adopting a “well, screw it all” attitude is too cynical to sustain. It’s bad for the soul. So here’s a handful of ways you can begin to remove yourself from the equation; largely, this all comes down to simply consuming less, to sacrificing the unsustainable grab-n-go convenience to which we’re all acclimated. Granted, the freedom to make a lot of these changes is a privilege that comes with comparative wealth, leisure, and not living in a food desert. But for those who I suspect are reading? You can probably manage to implement a few. In certain places in the U.S., consuming tap water isn’t an option, thanks to old infrastructure and a healthy dose of institutional racism. According to the L.A. Department of Water and Power, however, what comes out of the tap in L.A. is “just as good, if not better” than bottled water. Now buy a goddamn BPA-free Nalgene and stop bringing home palettes of the bottled stuff, and stop contributing to the 35 BILLION plastic water bottles Americans throw away every year. By now you should be relying on reusable totes for bringing home your groceries, but no one’s in a hurry to pass a ban on those little plastic bags you put your asparagus in. Turns out, there’s a solution: reusable cotton bags with lil’ drawstrings that work for produce and also those self-dispense nuts and grains. You can even make them yourself, if you’re crafty. Bar soap is a no-brainer, but if you insist on a liquid body wash (why, tho?) over a bar, try something like Dr. Bronner’s, which is multipurpose and comes in a recycled bottle. Bar shampoo, however, can be a tougher nut to crack, especially for people with long hair. The good news is that bar shampoos have vastly improved in recent years (Lush makes a bunch of especially good varieties). Next step: deodorant that comes in a glass jar, but we’ll let you pace yourself. Stash some tupperware in your purse or whatever. You’re gonna feel deeply nerdy when you bust it out, but you know, if it negates the need for another hunk of styrofoam to sit in a landfill for centuries, why not? You know those moments where some sort of plastic product is basically forced on you? Speak up. Ask for your coffee for here—or if you aren’t going far, at least skip the lid. Nix straws. Request no plastic silverware in your takeout bag. Generally adhere to the 100 rules laid out on My Plastic Free Life. I knowwww. It’s expensive. How could yogurt and peanut butter packaged in glass possibly cost twice as much as the stuff in plastic? But listen. 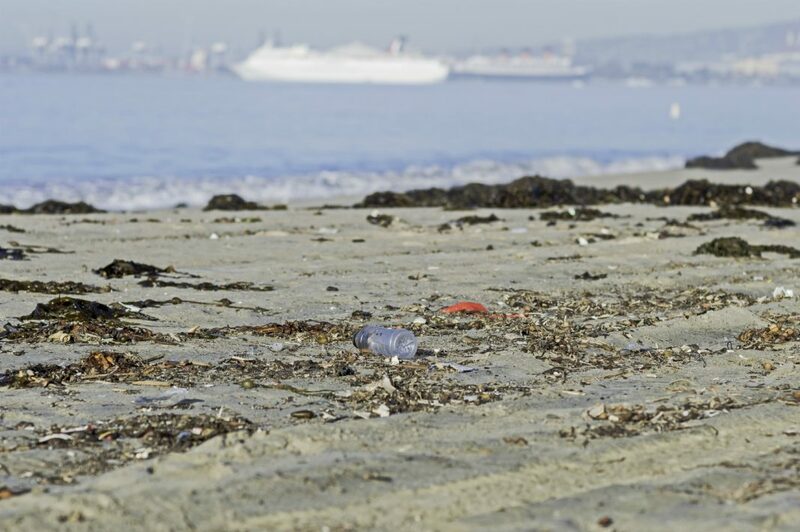 Poison-absorbing microplastics have been found in a quarter of all fish California markets. Plastic is washing up on the shores of the most remote islands on earth. It’s turning up at the bottom of the Mariana Trench. I get that you’re on a budget, and it’s totally not fair that this kind of ethical decision making gets passed down to us lowly consumers…but don’t we have to do something? Don’t do it for the supposed health benefits. Do it because, at the current rate of soil degradation, we only have 60 years worth of viable soil left for farming. That organic certification ideally ensures that produce is grown without the synthetic pesticides and fertilizers that wreck soil health. Plenty of people will argue that organic produce is a lie and for suckers—that it’s just the same old fruits and vegetables marked up in price—and who knows, maybe they’re sometimes right. But again, cynical resignation in the face of impending apocalypse seems bad. Go organic when you can. Livestock produces somewhere in the vicinity of 15 percent of all human-induced greenhouse gas emissions—in addition to a disconcerting amount of air and water pollution—and it’s vastly more detrimental than any vegetable or cereal crop. Meat and dairy, per an analysis cited in The Guardian, account for 83 percent of all farmland. And according to one of the researchers quoted in the article: “A vegan diet is probably the single biggest way to reduce your impact on planet Earth.” Which, granted, is super hard if that’s not what you’re used to, but simply eating less meat is still an applaudable choice. Just don’t do it, man. It’s bad. Ride a bike. Seriously, ride a bike to work a few times a week. Take the bus. Do the whole Amtrak thing when you can. Transportation accounts for nearly a third of greenhouse gas emissions. Obviously, if you’re reading this and you live in a rural area, I get it, you need your car—but the rest of us don’t have much of an excuse.